DEAL of the Day- temporarily marked down from $15 to $9, today only. Happy beading! 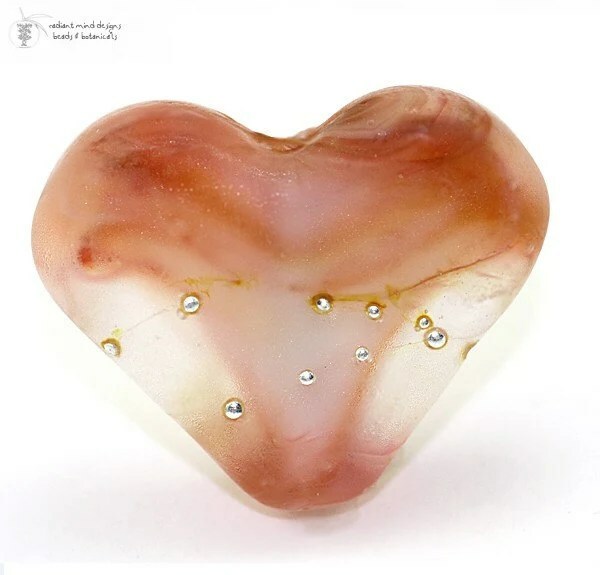 PEACH STONE HEART| Creamy Pastel White encased in Peach and Apricot Blend and Crystal, sprinkled with droplets of Fine Italian Silver, and etched for a matte smooth as sea glass finish. One (1) Glass Heart Tab Lampwork Bead. This Glass Bead measures 23mm with a 2mm bead hole. Posted in daily deal, deal of the day, lampwork bead daily deal, lampwork sale, red heart bead, valentine beadBookmark the permalink.